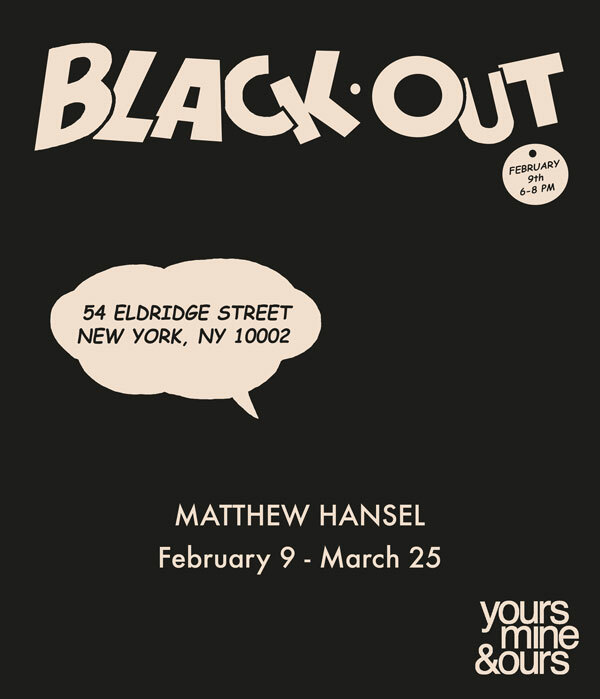 yours mine & ours is pleased to present, BLACKOUT, a solo exhibition of new paintings by Matt Hansel. Exploring the dark space wherein we allow ourselves to creatively take a leap of faith, Hansel crossbreeds traditional modes of European painting with comic imagery, all the while coating these recognizable images in shades of grey awaiting illumination. Hansel’s work takes aim at the creative process. A porcelain figurine occupies the foreground of each painting, bearing witness to the dialogue within. In each canvas, he has layered abstract images, traditional European painting, warped cartoons and the front-seated trompe l’oeil figurine creating a visual assault that begs the viewer to grapple with the hierarchies within modes of representation– high and low. In allowing these complex narratives to exist on the same canvas, one is reminded of the uncertainty that can exist when anything is possible but also, the creative freedom that can flourish if given the space. The main gallery space is painted a dark grey to match the palette of Hansel’s canvases. The exhibition’s title, BLACKOUT, harkens to WWII terminology and regulations where British citizens were required to cloak all windows and doors with blackout curtains as a protective measure from the bombers above. This created surprisingly warmly lit homes that contradicted the vast darkness seen from above. An apt metaphor for the meditations on creative process–an immeasurable distance between thought and object in which anything could happen. The very phrase BLACKOUT brings to mind a dark void. Power blackouts, news blackouts and blackout dates all indicate a sense of something lost. Here Hansel has painted the word BLACKOUT across the tops of each canvas in a comic book font, alluding to the potential for action that might occur. His trompe l’oeil figurines rest in the foreground, ready to bear witness to this potential, reminding us of the pure absurdity of a creative act. Matt Hansel (b. 1977) lives and works in Brooklyn, New York. Hansel received his MFA in painting from Yale University (2001) and has exhibited internationally, including Milan, London and Tokyo and all over the United States. In 2011 Hansel received the New York Foundation for the Arts Grant in drawing and his work has been written about in The New York Times, The Brooklyn Rail, Vice, Time Out New York, and more. This is Hansel’s first solo show with the gallery.